The winners of the 14th annual Appalachian Mountain Photography Competition were announced during the Banff Mountain Film Festival World Tour stop in Boone over the weekend. Jurists were Andrew Caldwell, a professor of commercial photography, as well as a practicing commercial and contemporary fine art photographer, and Ann Pegelow Kaplan, a professor in the Department of Cultural, Gender, and Global Studies, and a faculty affiliate of the Department of Art and Interdisciplinary Studies. Presented by ASU Outdoor Programs, the Turchin Center for the Visual Arts, and Virtual Blue Ridge and sponsored by Mast General Store, the 14th annual Appalachian Mountain Photography Competition receives support from Appalachian Voices, Blue Ridge Parkway Foundation, Footsloggers, Nikon, Bistro Roca, Peabody’s, and Stick Boy Bread. 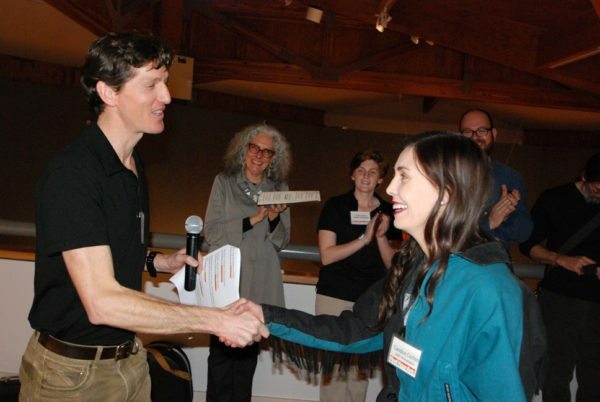 The winners were announced at the competition’s reception in the Turchin Center for the Visual Arts as part of Banff Film Festival Weekend in Boone. At the reception, Rich Campbell, organizer of the local Banff festival, said that the AMPC is one of the premiere photo competitions in the Southeast. Photographer Lynn Willis stands next to his winning photo: Adventure Winner – “Boardwalk in the Fog” by Lynn Willis, 14th annual Appalachian Mountain Photography Competition. Appalachian Voices senior communications coordinator Jamie Goodman stands with photographer Lynn Willis, who was Ecological Footprint Winner with “Top Burden Valley Fill.” Appalachian Voices sponsored this category. Rich Campbell, the organizer of the Banff Mountain Film Festival World Tour stop in Boone, congratulates photographer Robert Stephens, who won two awards. Rich Campbell, the organizer of the Banff Mountain Film Festival World Tour stop in Boone, congratulates, photographer Candice Corbin on her winning image. Rich Campbell, the organizer of the Banff Mountain Film Festival World Tour stop in Boone, stands with winning photographer Cathy Anderson. People look at the finalists of the 14th annual Appalachian Mountain Photography Competition. Photographer Kathryn Greven stands next her photo, “A Novel view of Grandfather Mountain,” which was a finalist in the 14th annual Appalachian Mountain Photography Competition. Photographer Candice Corbin takes in the refreshments. Photographer Lynn Willis was the Ecological Footprint Winner with “Top Burden Valley Fill,” which is in the background.